What's better on a hot summer day than a big bowl of smooth vanilla ice cream? 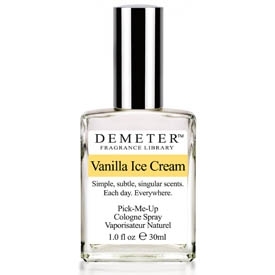 Demeter’s Vanilla Ice Cream Cologne is sinfully rich, but also bright, warm and inviting, like the summer’s day that inspired it. This sweet Vanilla Ice Cream Scent will brighten your mood each day you wear it. You may notice smiles as people pass you by as well! Since most of us can't afford to eat vanilla ice cream daily, at least we can wear oou Vanilla Ice Cream Perfume Spray every day! If you like Apple Pie a la mode, try this scent with a dab of our Apple Pie Cologne. Yum!